Titus, my third son has been wearing expanders for his upper and lower teeth for a good part of the year. He has large front teeth and his jaw is narrow, so his dentist, Dr. Marla Valenzuela, suggested that he get expanders to enlarge his jaw. These expanders are not cheap. They have also seen many adventures as Titus has, on different occasions, left them in places where he shouldn’t have, broken parts of them accidentally, and gotten them dirtied. During our recent trip to Singapore these expanders ended up in the trashcan of a Chinese restaurant, but I will get to that in a moment. 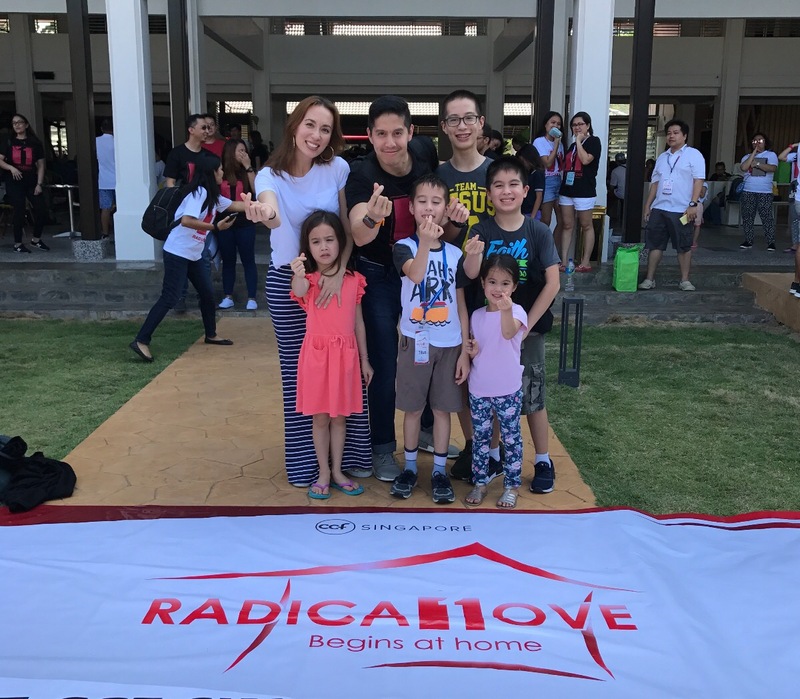 His culminating message was preached at CCF Worship Service in Singapore with the challenge to “Love More.” Our kids spoke with us during different messages of the retreat and the day that Edric spoke at church, we spent time with the leadership team over lunch at a Chinese restaurant. Titus, along with my four other kids, occupied tables with children of the leaders’ where they merrily engaged one another and played games. As for Edric and myself, we were caught up in conversation with the rest of the adults, exchanging stories about our faith journeys, marriage, parenting, and ministry. Since Titus forgot his expander’s case, something I’ve repeatedly reminded him not to do, he placed his expanders on a wad of tissue next to his plate before eating his lunch. Caught up in his interactions with new friends, he didn’t notice that the waitress innocently swept his expanders (and the wad of tissue in rested in) off the table onto a tray that was cleared into a trash bin. Edric and I had no idea either as we were seated separately from him during the meal. As the lunch came to a close for us we excused ourselves from the gathering to rush off to a bookstore before our flight home to Manila. We had promised Edan a trip to Kinukoniya, his favorite bookstore, to buy a science book. Intending to keep our commitment to him before leaving for the airport, we collected our children and bid farewell to everyone. It was at this time that Titus whispered to me that his expanders had vanished. “What happened? !” I asked, dumbfounded, that he didn’t realize this earlier. I glared at him for a moment, unimpressed by his simplistic deduction of the situation. Titus, looking clueless and helpless at this point, made it difficult for me to be upset. He obviously needed a solution, not a lecture. Yet, I feared that Edric would react in an irate way when I passed the problem on to him. After all, we were in a rush and tight schedule before our flight home. I was going to propose that we leave the expanders buried wherever they were. I wasn’t about to go digging through the trash with my bare hands to sift through all the used tissue, dirty food, and mysteriously sticky goo! Most certainly Edric wasn’t going to do it either, not dressed in his Sunday shirt, and especially because he gets more disgusted by icky things than I do (or so I thought). Amazingly, Edric level-headedly assessed the situation, spoke to the waitress and asked to be directed to the trash. Without hesitating, he dug his hand into it and felt for the retainers, pulling napkins and objects out of the trash to examine them one by one. Was this my husband who was bent over the trashcan, sorting through the waste without making a single comment about how inconvenienced he was?! It most certainly was! What a dad! I suppose he saw what was really going on. This was a divinely appointed moment to apply four straight days of speaking about Christ-like love, and how it ought to impact our relationship with the family first. This was love in action. After five minutes of consistent digging, he got one expander, then the other, as our friends looked on and cheered. Titus smiled in relief, almost too happy to realize that he shouldn’t put his expanders back on right away before disinfecting them! I’m sure the experience profoundly affected Titus. Over the years he has gotten himself into a number of predicaments that required our intervention and problem-solving. Sometimes these occasions have been deeply aggravating because of how ridiculous they are. From getting his head stuck between rails so that we needed to carry his body and push it through in order to free him, to snipping his hair off so that his forehead was grossly exposed and exaggerated, to destroyed different electronic equipment in the home because he wanted to examine what was inside of them, to locking himself in a storage room so that the door had to be broken down, to swallowing a marble so that his intestinal area had to be x-rayed and I was told to examine his poop everyday with a stick to anticipate the exit of the marble, well, let’s just say that God has used him to teach Edric and I patience and grace. We do love him immensely and nothing will ever change that (something we’ve repeatedly told him), but these occasions do tempt us to react with irritation. As we walked to the train station, Edric put his arm around Titus to let him know that everything was okay. He was forgiven.